I’m a huge fan of Benjamin Wallace-Wells, and this month he has a terrific profile of Mitt Romney in New York magazine. But it probably isn’t really right to call it a profile of Romney per se. It’s more a profile of the Romney method, the way that Bain Capital, the private equity firm he ran during the 80s, helped usher in the shareholder value revolution that made American businesses leaner and meaner; spurred mass layoffs in the name of efficiency; and made huge, performance-based compensation for executives a standard feature of American corporations. What separates Romney’s plan from Obama’s—and gives some clues about his potential presidency—is its almost-accidental origin. Romney did not begin with a philosophical quest to improve American health care. He began with the idea of himself as a problem solver and asked those around him for a problem that he might usefully solve. I remembered, when I was told this story, an anecdote I’d heard from a former political staffer of Romney’s. On even basic philosophical questions like abortion, the staffer said, Romney did not try to resolve the question in the abstract, as a matter of principle, and would consider instead various hypothetical cases—for instance, a late-term abortion—and build from them a politics. 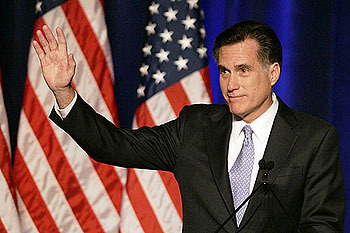 The line that Romney is a flip-flopper may vastly understate the depth of the condition. It is arresting to imagine a Romney White House, inevitably filled with as many former Bain colleagues as each of his other public ventures have been: The PowerPoints, the 80-20 jargon, the clinical separation of decision-making from ideology, the detachment of those decisions from moral consequence, a persistent blind spot for people as people. It would represent the final ascension of a perfectly American type, one that has already remade the culture of business. I once asked a Bain colleague of Romney’s how Romney thought of his own core competence. “I think Mitt thinks he’s good at being Mitt Romney,” the colleague said. It’s hard not to think of Robert McNamara and the whiz kids when you read that, and hard not to wonder if Romney’s updated version would be equally disastrous. It would probably depend on circumstances. In Massachusetts it basically worked out OK. But if something like the Vietnam War crops up during a Romney presidency, it might not. Anyway, read the whole thing. Immersing yourself once again in the LBO fever of the 80s and its consequences might or might not make your day, but it does give some real insight into Mitt Romney’s character. Since he might very well be your next president, that’s worth knowing.